E loves to blow bubbles! Even more so, she loves to do it all by herself. Unfortunately, slippery soap combined with too much excitement, usually leads to a messy spill on the ground, slimy hands, and shoes ready for an immediate trip to the laundry room. We have been using it for about a week and blowing bubbles has finally become a stress-free and fun activity for both kiddo and mommy. E feels independent doing it all by herself and mommy doesn’t have to hover near by on a constant drop/spill watch. What’s so special about it? The tumbler keeps the bubble solution in the bottom half and, when flipped upside-down, catches it all in the upper/larger part before any has a chance to spill out. That’s because the wand has to travel down a narrow shaft to reach the soap instead of through a standard open-wide top. Basically, it’s genius and I wish I had thought of it! The wand itself fits neatly into the opening and stays put when not in use. The circular opening at the end of the wand – through which you blow the bubbles – is about .5 in wide. Because it’s a bit on the smaller side, I was at first worried it would prove to be too challenging for E, but it actually works better than some larger ones we’ve tried. It is easy to maneuver for tiny fingers and it takes less work/air to blow a bubble. No leaks! Even when held upside-down. Does the tumbler stay completely bone dry? Of course not. Some soap – I’m talking drops – is bound to travel up on the wand itself, but it’s nothing compared to the other models. The set comes with the tumbler, wand, and a bottle of bubble solution. They retail at about $8.00 and are available online and through various major retailers. Visit LIttle Kids web site to learn more. OH! Almost forgot. 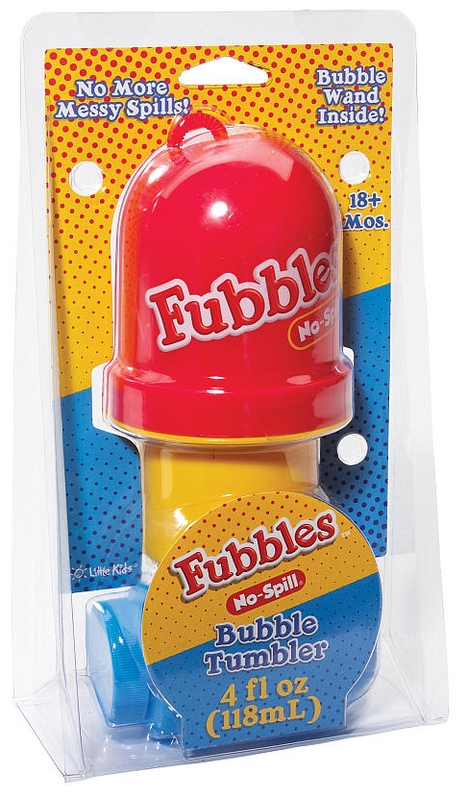 Check out the Fubbles Bucket for summer fun and Fubbles Minis for your next party (can you say kick-a** party favors?). Previous Post Lovely Dresses at the GAP & Old Navy. Next Post Nerd Alert! NYC Comic Con Kids Day Tickets on Sale Now.